The unique design of the double hitter was developed by Billy Burbank and Dusty Rhodes, Hall of Fame former head coach at the University of North Florida. As a coach, you can get double the number of bp swings in the same amount of time. The unique design of the double hitter was developed by Billy Burbank and Dusty Rhodes, Hall of Fame former head coach at the University of North Florida. Two Single Hitters side-by-side become the double hitting system which allows two hitters at once saving time for other drills during practice. As a coach, you can get double the number of bp swings in the same amount of time. Combinations for pitching can include: one right-handed live pitcher, and one pitching machine, or two pitching machines simultaneously. Additional protective screens are needed to complete the system including the Bi-Fold screen and two L Screens (to protect each pitcher/machine). 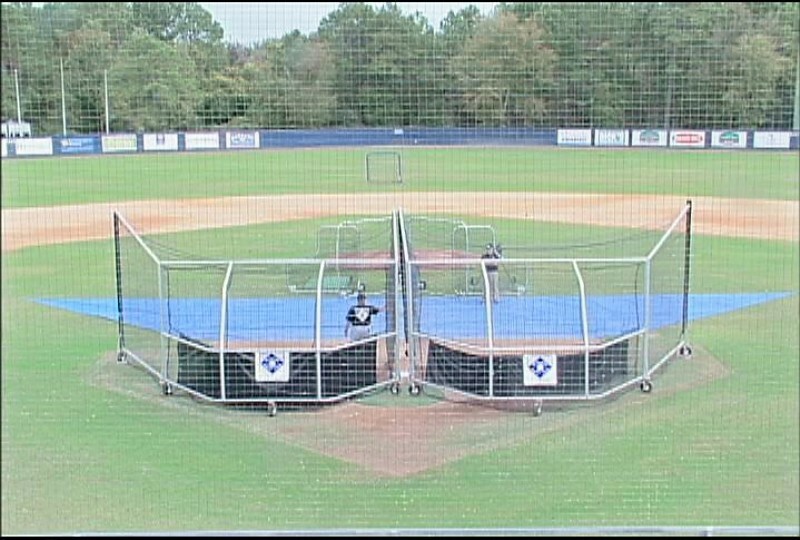 The Single Hitter unit is ideal for supplying backstop protection at camps where several games are going at once. Can be used indoors too.